The IRS ignored pastors participating in this event for years due to (what they say were) bureaucratic reasons, but they recently settled a lawsuit brought about by the Freedom From Religion Foundation and promised they would prosecute pastors who violated the law. 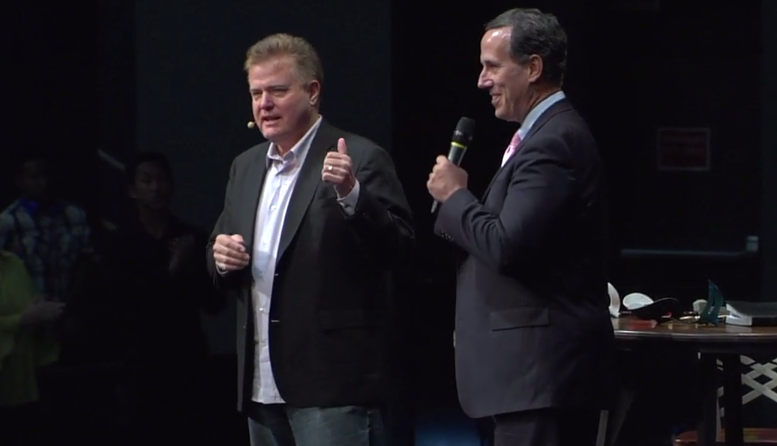 On Sunday, pastor Jim Garlow of Skyline Church in California stood before his congregation of more than 2,000 and told them he would be making an unusual announcement. … Garlow told his followers he would be endorsing DeMaio’s rival, Democratic incumbent Scott Peters, representative for California’s 52nd District, to send a scathing message to Republican leadership that candidates who back abortion and gay rights are unacceptable to the party’s Christian base. This is the choice we have before us and I urge you to do what’s right in this [election]: Either abstain or to vote for the lesser of two evils. And if, by chance, a member of the IRS gets this sermon and is listening, sue me. Hear that, IRS? He’s begging for you to come after him. It’s irrelevant that Garlow is promoting a Democrat over a Republican or telling his congregation to stay home. What matters is that he believes his faith puts him above the law, not to mention the rules all other non-profits have to follow. This didn’t happen in secrecy. The video’s right there. And Garlow was only one of about 1,800 pastors who told their congregations how to vote last weekend, according to the group sponsoring the event. It’s time for the IRS to take action and force these churches to pay taxes since that’s clearly what their leaders want.